In some cases a physical examination and bloodwork alone are not enough to diagnosis your pet’s illness. Your veterinarian may recommend advanced diagnostics such as an ultrasound to evaluate your pet’s internal organs. Like in human medicine, the safe sound waves of an ultrasound bounce off the internal organs or a mass, and are decoded into a detailed image. This is a powerful and versatile technique in which a skilled ultrasonographer can see, measure and assess the health of many internal organs including the liver, spleen, adrenal glands, pancreas, kidneys, prostate, bladder and uterus. 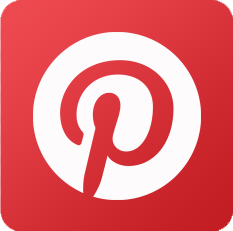 In some cases, it can guide or preclude the need for surgery. The ultrasound examination itself is virtually risk free. In most cases, it can usually be done without anesthesia or sedation. If a biopsy is required, sedation and/or brief anesthesia may be necessary. Biopsies are usually done with small needles, thus avoiding surgery, and can be submitted for review by a board certified pathologist. We also use ultrasound to confirm pregnancy and an approximate litter count as soon as 21 days after the last breeding date. 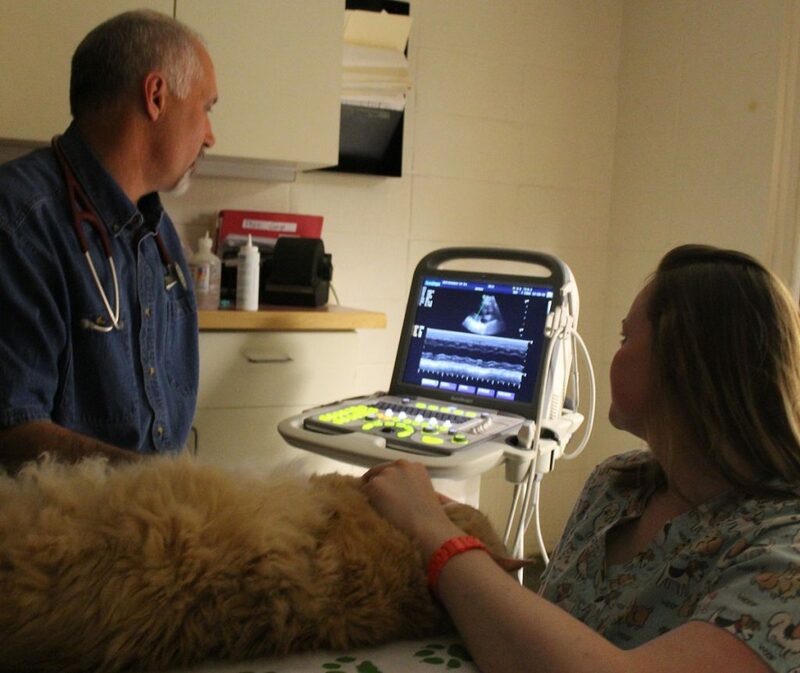 Echocardiograms, commonly knowns as “Echos” are ultrasounds of the heart and are used as a diagnostic tool in pets suspected of having heart disease. An echo may also be performed in pets with newly developed murmurs, pets with established murmurs that will be undergoing a surgical procedure, or pets with suspected congenital birth defects. As with other organs, the waves bounce off the heart allowing non-invasive visualization of the heart muscles, valves and arteries. The ultrasonographer will use the ultrasound to obtain measurements and can assess the structure and characteristics of the heart. Since the heart is beating, function can also be evaluated. Your veterinarian may order additional tests such as chest x-rays, an electrocardiogram (ECG), and analysis of any fluid present in the chest cavity. Patients with more severe heart disease may be referred to our board certified cardiologist at Portland Veterinary Specialists. While our pets cannot verbally communicate to tell us how they feel, the use of diagnostic tools can help your pet’s medical team piece that information together. Digital x-rays are helpful in identifying a number of different health conditions including musculoskeletal issues such as bone fractures, hip dysplasia or arthritis and can also be used to examine your pet’s internal organs such as the heart, lungs, liver, kidneys or intestines. These x-rays may help us identify abnormalities such as masses, fluid, or a “foreign body”, which is more commonly known as something your pet should not have eaten! Our radiology equipment is similar to what you would experience if your doctor ordered x-rays for you. Like people, most pets are able to have their x-rays performed without the use of sedation, however, in some instances it may be needed to manage pain control for traumatic injuries or ensure proper positioning. Because we use digital radiology, once the x-rays have been taken, they are viewable almost immediately through-out our hospital. Additionally, our software allows for the image to be manipulated, rotated or zoomed in and out to assist in the diagnosis. 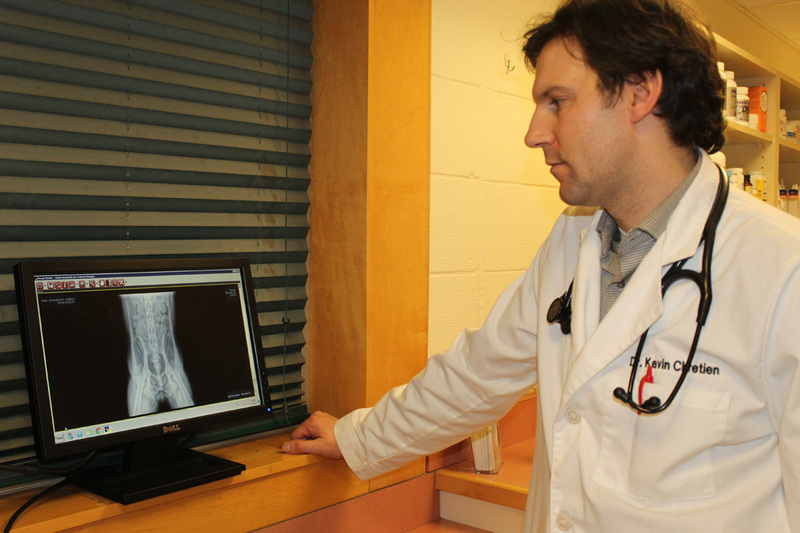 Another benefit of digital radiology is our ability to send your pet’s x-rays via email. This is especially helpful should you move out of the area or your pet is being seen by a specialist. The images that are taken in our office can be forwarded to the veterinarian to ensure a complete medical record. In complicated cases, your pet’s x-rays may also be shared with a board-certified radiologist for review and consultation.